Last Saturday saw the closing night of our fantastically received production of Chicago, as soon as the curtain fell for the last time the stage was already being carefully dismantled and cleared for the next show. But so is the pattern of a theatre season in continuous flow. The final show of Chicago ended on a particular high with it being a completely full house on the evening, not bad considering there was also a matinée performance that same day. It was a fitting way to end, but come to an end it has. Now we have a very different show altogether taking place until Saturday 26 October – No Fat Juliets. This particular show is a co-production between the fantastic Dukes Theatre in Lancaster and ourselves. Working alongside the Dukes to help create this new and original play has been a pleasure and having the show transfer here to Oldham after its run in Lancaster allows for two different audiences to see it. 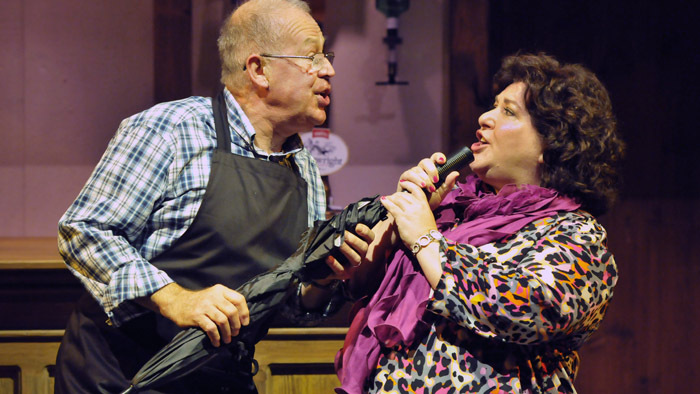 No Fat Juliets is a play with songs and a warm-hearted comedy with a strong northern thread running through it. The story is set in a traditional family run country hotel in the stunning Lake District and the cast of the show even decamped to a small hotel in the quiet village of Cartmel for their preparations to soak up that rural atmosphere. The rural north of England via Lancaster and Oldham might well be a million miles away from 1920s Chicago but the Coliseum auditorium is the setting for many varied destinations this season. Chicago was a fantastic place to start but there are plenty more places to explore, be that a Lakes hotel, a giant city in the clouds or even Dr Who’s home planet of Gallifrey.